This Wednesday evening, October 5, you have the opportunity to be enlightened on some important issues from our country's history that are still prevalent today. Levine Museum of the New South presents "Para Todos los Niños/For All the Children: Access to Education, Then, Now, and in the Future," featuring a conversation with Presidential Medal of Freedom recipient Sylvia Mendez and The Honorable Judge Albert Diaz. They'll explore educational access and community equity. The event, sponsored by Norsan Multimedia, takes place 7 p.m. at McGlohon Theater at Spirit Square, 345 N. College Street. Admission is free. 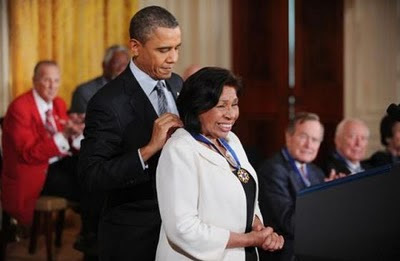 Sylvia Mendez received the Presidential Medal of Freedom in February. Featured in Levine Museum's current exhibit about the 1946 Mendez v. Westminster School District court case, Sylvia Mendez learned about discrimination at a very young age. When she was eight years old, her parents attempted to enroll her in a local all-white school close to her home. She was denied admission and directed to the all-Mexican school in their California community, a school with significantly fewer resources. Sylvia's parents refused. Her father, Gonzalo Mendez, a Mexican immigrant, and her mother Felicitas Mendez, a Puerto Rican immigrant, decided to sue the school district, The subsequent case Mendez v. Westminster led to a landmark decision in the fight against educational segregation. Many commentators say the case was won largely based on young Sylvia’s testimony. Admission is free; reservations recommended. To reserve seats, contact 704-333-1887 ext. 240 or lfairbrother@museumofthenewsouth.org.